Here’s my entry for the Monteleone Cocktail contest. 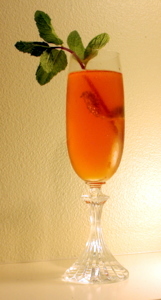 Shake all ingredients except mint and sparkling wine, and strain into champagne flute. Top with sparkling wine. Slap mint and garnish glass. This is my first cocktail contest outside of TDN. My inspiration clearly comes from the sazerac. I wanted to create a drink that was lighter, but still redolent of the flavors I associate with New Orleans cocktails. What flavors do you associate with New Orleans?